Drummondville (Quebec) – The range hood is one of the most important appliances in the kitchen. Not only is it vital to enhancing the design of the kitchen, but it also protects you, your family and dinner guests from the hazards of cooking by products like carbon monoxide, dangerous fumes, and bad odors. The all new Broan®, NuTone®, Venmar® Bistro and Venmar® Chef range hood line is taking the under cabinet category completely over the top. It's a category reinvented, with the new CapturTM system that redefines performance. We asked consumers what they liked, what they wanted, and we built it. And, we added exclusive features so there is a fit for every kitchen which is exactly what the consumer expects. 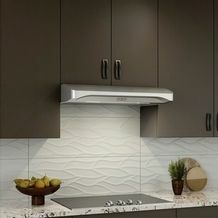 The new under-cabinet range hoods, featuring the CapturTM System, allow consumers to enjoy new stylish, modern designs and advanced features, all while benefiting from the most effective capture of smoke and odors of any range hood or over-the-range microwave in its class. "Our new under-cabinet range hood line allows to provide customers with the performance and the features they expect, all while keeping homeowner's style needs in mind," said Stephanie Lacroix, Global Category Manager, Kitchen Ventilation, for Venmar Ventilation ULC. "We created a whole new range hood line with better overall performance, quieter operation and great long-lasting LED lighting. The main reason consumers buy a range hood is to remove smoke and odors. The new range hoods, with the Captur™ System, deliver an average of 98.5% capture efficiency making them best-in-class at quietly removing smoke and odors." The new range hood series is available in fresh new shapes and beautiful trendy colors like stainless steel, white and black, as well as a black stainless steel, pushing the design envelope of typical under-cabinet range hoods, yet complementing today's kitchen style needs. With a performance from 250 CFM up to 600 CFM, even the most serious cooks will appreciate the superior ventilation the series offers. Look for the models offering the option of ENERGY STAR rated efficiency. Additionally, the high-flow filtration design enhances grease capture, improves airflow and reduces noise. Several styles of filters are offered including a unique hybrid baffle style filter providing greater filtering efficiency than standard baffle filters. The EZ-1 Installation system, which includes an exclusive bracket system designed specifically for the new range line, makes single-person installation easier than ever before because it eliminates the need to constantly hold onto the hood. Homeowners simply mount two brackets with no measuring or cutting, slide the hood on, make the connections and secure the hood with four screws. Installation takes less than half the time when compared to traditional methods. State-of-the-art LED lighting system provides bright, full-surface cooktop lighting. Designed and tested to operate in the heat of cooking environments, the LED lighting lasts longer without dimming. The new line also offers models with the control options consumer demand, from simple switches to sophisticated touch and infrared solutions. For more information, visit www.broan.ca , www.nutone.ca or www.venmar.ca. Founded in 1978 and leader in the indoor air quality in North America, the company has pushed the limits of ventilation thanks to numerous investments in research and development. In 1995, Venmar became part of Broan-NuTone LLC. With its numerous products and steady increase, Venmar Ventilation aims for the highest standards and remains a company where culture of innovation is promoted with determination, to the benefit of consumers here and abroad. In 2016, Venmar became the Centre of Excellence of Research and Innovation for three of the group's core product categories: indoor air exchangers, kitchen ventilation and central vacuums. Proud to provide every North American home with a complete range of products including whole-house air exchangers, range hoods and attic ventilators under multiple brands such as Broan, NuTone, Best, vänEE and Venmar, allowing revitalization of the whole house. Venmar Ventilation believes in quality; so it continuously improves its products, its processes and its quality management system to maintain its leadership position. Broan-NuTone LLC is a global, diversified company whose many market-leading brands deliver broad capabilities and a wide array of innovative, technology-driven products and solutions for lifestyle improvement at home and at work. BROAN® is a registered trademark of Broan-NuTone LLC, North America's leading manufacturer, a Global Leader in Home Air Quality solutions and a distributor of residential ventilation products including range hoods, ventilation fans, heater/fan/light combination units, balanced ventilation systems (IAQ), built-in heaters, and attic ventilators. NuTone® is a registered trademark of Broan-NuTone LLC, North America's leading manufacturer and distributor of residential built-in convenience products including door chimes, central vacuum systems, ceiling fans, intercom systems, ironing centres, and ventilation fans. NuTone has been the preferred choice of electrical professionals since 1936.